Fifteen percent of the horses in the United States suffer laminitis at sometime during their lifetime. This is more than 1 of every 7 horses. Most horses survive but many have lingering problems for years to come. While research continues on the mysteries of laminitis, a growing understanding has resulted in greater prevention and treatment options. 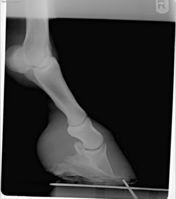 Laminitis is when the tissue that connects the hoof to the coffin bones becomes inflamed. This tissue, called laminae, supports the entire horse. Inflamed laminae may stretch, swell, and separate causing severe pain and lameness. Sixty percent of the horse's weight is carried on the front limbs and this is where the condition most often occurs, however all four or just one leg may be affected. Severity can range from very mild cases that may go unnoticed or misdiagnosed; to severe cases that require euthanasia due to the extent of suffering. The treatment for laminitis is more varied than for any other equine diseases. Laminitis is an emergency and should be treated as soon as possible, preferably before any symptoms appear. Laminitis can be categorized as acute or chronic. Acute (severe form) usually involves more severe signs. The horse is more painful and does not respond rapidly to treatment. Coffin bone rotation is more likely to occur. Horses with both front feet involved often stand in a "saw horse" stance where they try to shift all their weight to the rear limbs by drawing the rear legs further beneath the body. If all four legs are involved the horse tends to lie down for extended periods of time. Anxiety, muscle trembling, reluctance to move to pick up a hoof, bounding digital pulses, and heat at the hoof or coronary band are often present. Horses may or may not show sensitivity to hoof testers. Refractory laminitis is an acute laminitis that does not respond or responds minimally to treatment during the first 10 days of treatment. The clinical course of the disease is related to the amount of lamellar damage that has occurred. Minimal damage to the laminae respond to treatment quicker and are less painful. Extensive damage to laminae respond slower or not at all and are much more painful during course of disease. Subacute laminitis is a milder form with less severe signs. Some of these are caused by trimming too short, walnut shavings toxicity, or road founder from a horse being worked on hard surfaces. These usually respond well to treatment without permanent damage or rotation of the coffin bone. The Early Chronic stage begins at the first sign of any movement of P3 (coffin bone ). This may occur in days or may take months. Some of these cases resolve with minimal movement (rotation) while others are so severe that the hoof comes completely off. In the chronic active stage the coffin bone has rotated and continues to rotate until it possibly penetrates the sole. Foot abscesses are quite common. 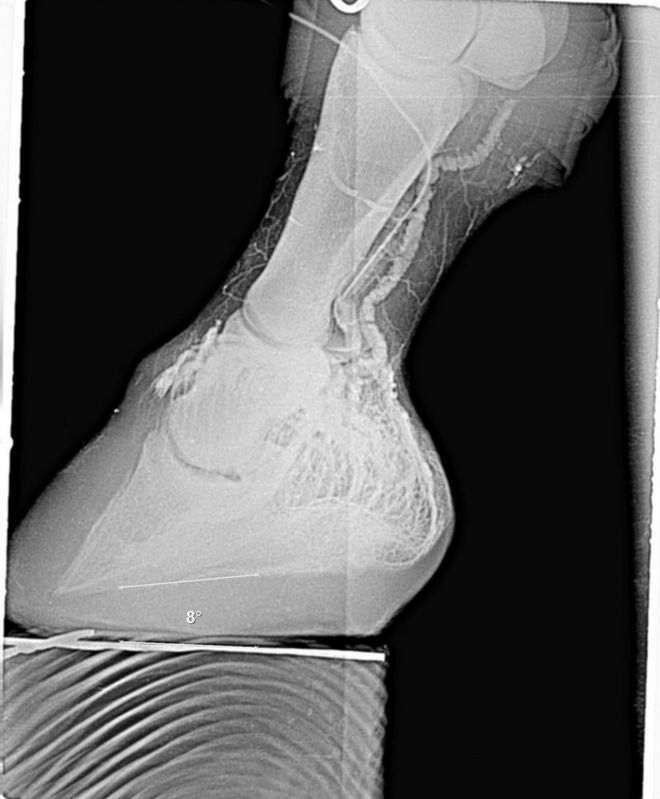 The coffin bone is unstable within the hoof capsule. In the chronic stable the coffin bone becomes stable and the hoof wall and sole begin to grow again. This is usually associated with slow clinical improvement. These hooves often have diverging hoof rings (fever rings), a dished hoof, and often the heels grow faster than the toes. Hoof tester response is often variable due to loss of hoof integrity, blood supply, and tissue death. Dropped or flat soles often accompany horses with laminitis. The first step toward diagnosis is a veterinary exam. Abnormal stance, reluctance to walk, reluctance to have hoof lifted, increased pulse, heat, sensitivity to hoof testers over the sole area (not always), and pain if external hoof wall is tapped are all symptoms to be evaluated. An accurate and complete medical history is taken to try and determine a cause of the laminitis. 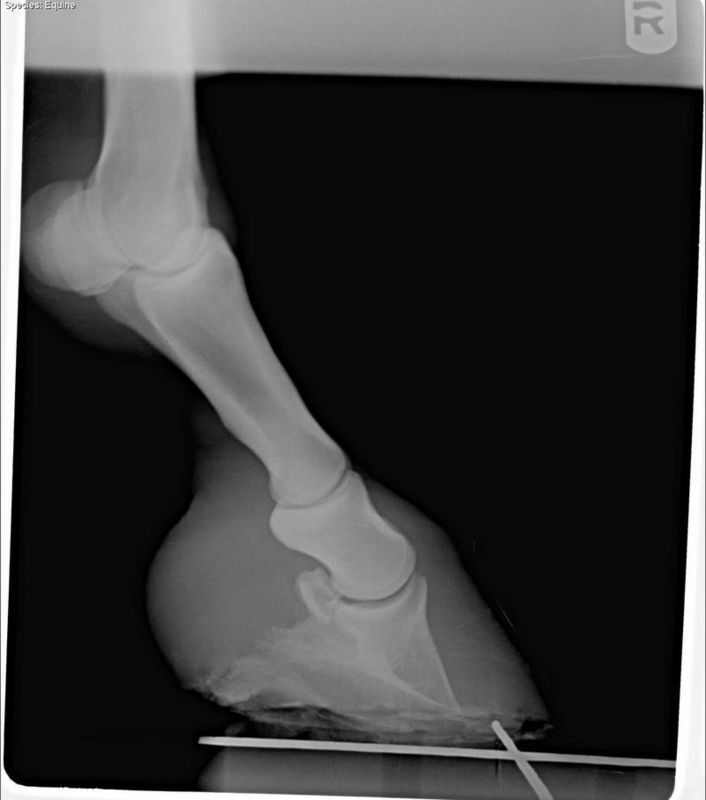 Radiographs should also be used to help diagnose and treat all cases of laminitis. Radiographs should be taken before and after shoeing to assess the amount of correction obtained. A thumb tack is often placed at the tip of frog to help determine the best point of breakover for that horse. A radiopaque material such as barium is placed on the distal hoof wall to insure accurate hoof wall measurements. 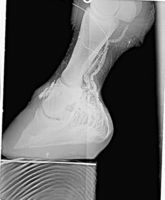 Venogram is one of the most significant developments in the diagnosis and treatment of laminitis.. A radiopaque dye is injected into a vein near the hoof. A tourniquet keeps the dye in the area. Radiographs are quickly taken. This allows us to visualize the vasculature of the foot. We can then see which areas of the foot are getting blood to that area and then trim the hoof to maximize blood flow into that area. The venogram provides the first detectable evidence that confirms laminitis. Some practioners feel that doing venograms itself is therapeutic in helping restore blood flow to some areas. Time is of the essence, but ideal results are obtained by quickly re-establishing a healthy vascular supply. Initial treatment involves proper diagnosis and assessment of severity of the disease. Then the disease is controlled on multiple fronts. The foot receives mechanical support, the diet is managed, the environment is managed, medical management is implemented and sometimes even surgical intervention is required. Mechanical supports starts with radiographs (x-rays). Several exact measurements are calculated. A qualified farrier and the veterinarian form a team with the goal of balancing the hoof with respect to the coffin bone. Effected horses are taken off all grain and food stuffs that contain sugar including apples, carrots, and other treats. Horses are removed from pastures or any source of grass. Inciting causes such as metabolic disease are identified and specific dietary recommendations are implemented to manage specific causes. Horses are treated with nonsteroidal anti-inflammatory drugs, analgesics, tranquilizers, and IV DMSO. Some horses receive autogenous stem cells. Stem cells are harvested from horse's fat and injected around the coronary band. In extreme cases the deep digital flexor tendon is surgically cut to decrease pull on the coffin bone and relieve stress on the lamina. By taking measures to avoid some of the precipitating factors, you can reduce the odds of your horse incurring laminitis. Horses over 15 years of age or presenting symptoms of endocrine disease should be tested and treated accordingly. This may require specific dietary restrictions. If your horse devours excessive amounts of grains or concentrates, call your veterinarian. Treatments are available to reduce the absorbtion of these feeds before laminitis symptoms appear. Limit grazing of lush spring grasses. Use corticosteroid drugs only as directed by your veterinarian. If you suspect that your horse has laminitis, contact your veterinarian for prompt diagnosis and treatment.